esp-go – Pete Scargill’s re-badged “Hackitt & Bodgitt” code for a universal i2c Nano peripheral extender for the ESP8266. Pete has mainly been updating the documentation for his code over the past couple of weeks. In the latest release, the name has changed to “esp-go.doc” to reflect the re-branding. badgy – SQFMI’s “Swiss Army” e-Ink badge,based on the ESP-12F. SQFMI has updated the code to work with the latest version (3.0) of the GxEPD library. mobile-rr – idolpx’s ESP8266 Mobile Rick-Roll Captive Portal. idolpx has added some images to the documentation to help novice ESP8266 users get a better grasp of what they’re doing, as well as updating the code to add DNS overrides and improve the WiFi scan filtering. Sonoff-Tasmota – Theo Arends’ all-purpose replacement for Sonoff firmware. A change to a non-blocking MQTT library as the default. Add support for the DS3231 RTC. Add support for the HX711 load cell. Add support for Pzem energy monitors. …as well as various fixes. IRremoteESP8266 – A library to enable IR send and receive on the ESP8266. Mark has updated the package to support Disney’s “Made With Magic” protocol. Over the past weekend, Theo pushed out another fairly big update to TASMOTA with some interesting new additions. 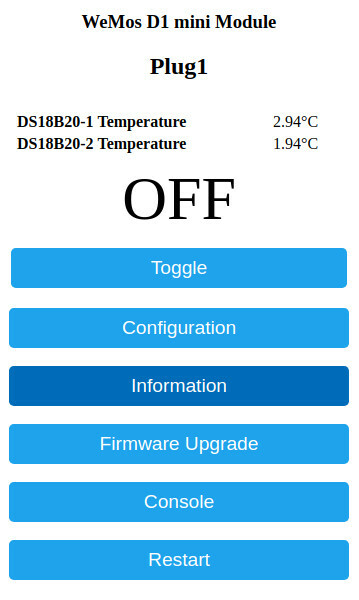 Addition of “rules”, to enable local, logical control of devices based on various inputs (so, for instance, a self-contained thermostat application can now be implemented internally on the Sonoff module, without requiring support via MQTT or other external methods). Addition of KNX UDP protocol support to enable integration of Sonoffs into building automation projects. The re-addition of variable support for MQTT client/topic values, using the ESP chip-ID. Addition of a new, optional OTA upgrade method to allow for a PlatformIO-type “push” of large binaries (up to ~700kB) without requiring the use of a local web server. Addition of support for hardware and software serial bridging (text only). Addition of support for the Zengge ZJ-WF017-A PWM LED strip controller (ESP12S based). Addition of support for the SGP30 air quality sensor. Addition of sunrise/sunset option for scheduling (by geographical location). As well as all of these new additions, there are a whole host of fixes and updates to existing features. Definitely worth checking this one out! Continuing with our series of articles on utilizing Theo Arends’ TASMOTA firmware on non-Sonoff boards and devices, in this article we’ll look at using MQTT to interact with the target. Feel free to skip over the next four paragraphs (between the horizontal delimiters) if you’re already familiar with the way in which MQTT works. Just in case you’re not familiar with MQTT, I’d like to emphasize here that it is not an interactive mode of communicating with your device in the way that using a serial adapter, console or telnet/ssh connection is. In concept it is more like using radios for verbal communication; you have both a transmitter and a receiver, but they are two separate pieces of equipment. If you transmitted a message, you wouldn’t hear any reply if your receiver wasn’t turned on and tuned to the appropriate frequency. Likewise, without a transmitter (again, tuned to the correct frequency) you would simply be a passive listener to whatever was received. MQTT is similar; you need to know the “frequency” (the topic) which you want to communicate on and you need a transmitter (a publisher), as well as a receiver (a subscriber). To complicate matters a little further, you are running your radio equipment in a deep valley, surrounded by mountains. In order to use your radio you need to use a repeater station, situated on a nearby summit. The operators of the repeater are very generous and will freely rebroadcast anything they receive on to you , just as long as you tell them which frequencies you want to receive. All of your radio traffic, both outgoing and incoming, needs to go via this repeater. In MQTT terms, the repeater is a “broker” which will listen for messages and rebroadcast them. You can receive and transmit messages at will, as long as you specify a topic. The most common MQTT broker for home use is Mosquitto, which comes with a couple of command-line utilities, “mosquitto_sub”, a subscriber (or receiver) and “mosquitto_pub”, a publisher (or transmitter). You would run Mosquitto on one of the machines on your home LAN (say, perhaps a Raspberry-Pi or a dedicated NAS or back-up system which is running 24/7). The Mosquitto daemon provides a fully functional MQTT “broker”, but you can also install the mosquitto-clients package on your desktop or laptop to make the mosquitto_sub/pub utilities available, without the overhead of the full daemon. You won’t automatically get any response from a “pub” message sent to your ESP, unless you are also listening to the correct topic with a “sub”. MQTT is a distributed protocol, in the sense that your subscribers will usually be on a different physical machine than the publishers and probably neither of them will be on the same machine as the broker. On the ESP8266 side, there are a few libraries available which give moderately pain-free access to MQTT from your program. Currently I’ve been favouring Nick O’Leary’s PubSubClient library and, luckily, Theo includes it by default in TASMOTA, so you don’t need to do anything extra; MQTT capability is built-in. So, lets get started with MQTT. As suggested in the previous article, I’d recommend opening up the wiki page describing TASMOTA commands and using it as a handy reference while you’re playing with this. However, before we jump into the commands themselves, I’d recommend that you bring up two separate windows on your display to allow you input “transmissions” in one window while simultaneously being able to see received messages in the other (if you’re using a full-screen terminal window on some modern version of Un*x, you can also use the “screen” utility to split your single window into top and bottom halves, using “CONTROL-A S”, followed by “CONTROL-A TAB” to swap between the new, top and bottom windows and then “CONTROL-A c” to create a new shell in the bottom window [¹]). …where “mybroker.mylan.com” is the machine where the main mosquitto daemon is running (your “broker”) and “sonoff” is the “friendly name” you’ve given your module in TASMOTA. The “#” character at the end of the topic string (“stat/sonoff/#”) is the MQTT wildcard character and, in this case, tells the mosquitto_sub command that we want to see all messages that match the “stat/sonoff/” string, whether they be the result of command execution or specific subsystem (ie:- memory) informational messages. If your broker process is running on a separate machine, the commands which you type in can get quite long, so I’d also recommend building up a couple of aliases for the mosquitto_sub and mosquitto_pub commands (I covered this in an earlier MQTT how-to article). The “-n” tells mosquitto_pub that there is no message part to this particular command. …or possibly “ON”, of course. 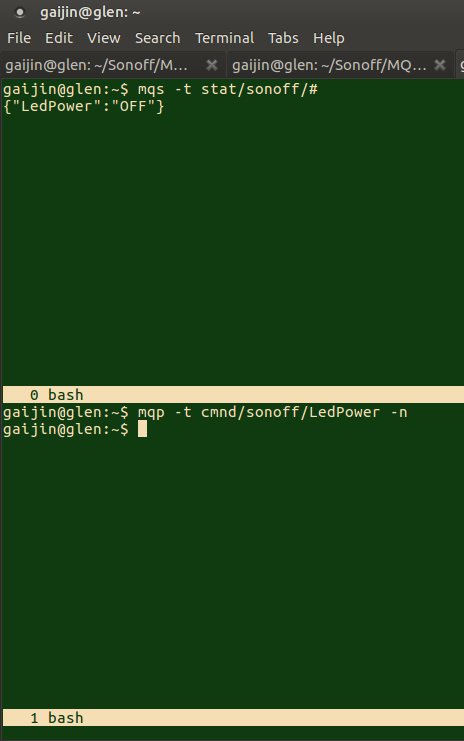 mqp -t cmnd/sonoff/LedPower -m "on"
mqp -t cmnd/sonoff/LedPower -m "off"
…to turn it back off again (hopefully your ESP8266 module is somewhere within sight, so that you can visually check that these commands are indeed working). Our next command will return the status (the current pwm count between 0 and 1023) for each of our previously assigned PWM drive pins (the red and blue LED segments of the RGB LED on the Yellow Dev board). mqp -t cmnd/sonoff/pwm1 -m "750"
mqp -t cmnd/sonoff/pwm2 -m "350"
Note that the response status from the command still includes all of the defined PWM pins, even though our command lines only change one GPIO pin at a time. Following along from the examples we went through previously in the “Console” tutorial, we’ll now request TASMOTA to send us the status (including the data) from our on-board temperature sensors. If you remember, we needed to send the command “status 10” from the console, which translates into another command string for mosquitto_pub. mqp -t cmnd/sonoff/status -m "10"
…are more interesting. The strings “DS18B20-1” and “DS18B20-2” are arbitrary identifiers used by TASMOTA to identify individual one-wire temperature sensors. The “Id” numbers are the actual serial numbers of the DS18B20s themselves (each sensor has a unique serial number burned into its ROM when manufactured). “Temperature” is again obvious, but just in case of ambiguity, the last part of the StatusSNS data (above) is a specifier for the temperature unit being used (in this case, Celsius). mqp -t cmnd/sonoff/setoption8 -m "1"
Okay, we’ve covered the same commands as we did in the “Console” article and reached the point where TASMOTA and MQTT are delivering a bunch of useful data back to us from our project board. In the next part I’ll look at creating a shell script to automatically generate and handle that (JSON) data, so that you can actually control the relay based on temperatures. [¹] – Commands for manipulating virtual windows from within “screen” all start with a CONTROL-A character, so to create a new virtual window you would input the sequence “CONTROL-A c”, to change the current view to the next window would be “CONTROL-A n” and to change back to the previous window would be “CONTROL-A p”, and so on. Use man screen for more details. I’m not going to go too deeply into the specific hardware I used for my own project, but instead just give a couple of tips on using the Yellow board as a base for your own creations. First of all there’s that row of red LEDs. While they make for a neat “running light” display, there aren’t that many projects (ESP-based VU meter, anyone?) where they’d be truly useful. In addition to sucking the life out of your battery, they can also interfere with some peripheral connections by providing a pull-up path on the GPIO pins (the single RGB LED is a common-cathode device, by the way, so those GPIOs are pulled down). Sometimes the red LEDs are beneficial; for instance, I2C requires pull-ups and the LEDs also handily show activity on the bus, which can be an aid to troubleshooting. However, in general, we don’t want them there, especially on a battery-powered projects. I usually disable the red LEDs by removing the 470Ω current limiting resistors with a hot iron (why the resistors? …because I don’t have to try and figure out the correct polarity when replacing them, if I want to re-enable any of the LEDs). If you’re mounting the Yellow board in an enclosure of some sort, you may want to desolder the RGB LED and mount in the lid,so it can be seen externally. Be warned, because of the four leads (with the one which is the common cathode soldered to ground), this is a bit of a beast to remove, but it can be done with a big enough iron and some patience. If you are mounting the LED to the lid, it makes sense to add a momentary switch across the boot/program select jumper (GPIO0) and mount it in the lid, too. That will give you access to all of the Sonoff switch functionality built into TASMOTA. Whichever way you’re powering the Yellow board, from batteries or a mains adapter of some sort, it never hurts to add a nice chunky electrolytic capacitor on the 3v3 supply line (I generally use a 470µF). The existing SMD capacitor close to the edge of the board by the boot/program select jumper has the pads oriented just right to allow the leads of the electrolytic to be soldered on, with the body of the capacitor hanging over the edge of the PCB. A 5v supply from something like a phone charger works well with the Holtek regulator on the Yellow board (which has rather a low maximum input voltage rating, compared with some of the more commonly available 3v3 regulators). With the current version of TASMOTA (5.11.1), the one-wire bus for DS18x20 sensors is limited to a single GPIO. You can have multiple sensors on that GPIO, but you can’t have (for instance) one DS18B20 on GPIO4 and another on GPIO5; only one of them will show up. If you want to have more than one sensor on your one-wire bus, you should use Theo’s specially crafted sonoff-ds18x20 binary (or define USE_DS18x20 in the user_config.h file when building your own). The “PWM” designations for GPIO14 and GPIO15 allow us to control the brightness of the LEDs attached to those pins. We could just as easily have assigned them as “LED2” and “LED3” to use simple on/off switching, instead. The serial port on the ESP itself. DO NOT use the serial port method with a mains-powered project unless you remove external power and use the serial adapter to provide DC to the ESP. I’d recommend that you program the ESP with the serial adapter before fitting it to any mains-powered project and from that point onwards limit yourself to OTA upgrades and using the Web and MQTT methods for configuration and testing. Note that using a serial adapter generally doesn’t supply enough current to reliably drive multiple LEDs and a relay, so I wouldn’t recommend this method, anyway. For either of the remaining methods, the essential reference guide is the “Commands” page of the Sonoff-TASMOTA wiki. You should keep that guide open in your browser while you experiment. The “console” option of the web interface provides a very versatile method of monitoring output, as well as enabling input and, together with the previously discussed configuration menus, is pretty much all you need to get your ESP project up and running. You can input commands by selecting “Console” from the main TASMOTA menu and typing them into the input box displayed at the bottom of the screen. The results will be displayed in the main console window. …to check the current status of the green LED (LED1), then turn the green LED on, turn it off again and finally check the status to verify that it was off (note that the final “ledpower” command was entirely spurious, as the device had already echoed an “MQT” status message in the main console window to indicate that the LED was “OFF”). The commands to control the relay are similar. We simply replace the “ledpower” with just “power”. Typing in “power” on its own will return the current status, while “power on” and “power off” do exactly what you’d expect and also return a confirmation message, just as the “ledpower” command did. Controlling the PWM drive to the red and blue LEDs is only very slightly more complicated. Entering “pwm” gives us the status (of both PWM1 and PWM2), while entering “pwm1” or “pwm2” followed by a numeric value between 0 and 1023 will produce an output brightness in proportion to the value entered (and, as before, the console will show a message confirming that the action has been completed). Reading the one-wire sensors is even easier still. As long as there are no hardware or configuration issues, the temperature(s) will always be displayed at the very top of the TASMOTA main menu. Using the console command line is slightly more obtuse, though. The temperature readouts are a part of the TASMOTA status group, so you could type in the command “status 0” to get a full display of all possible status items. However, if you do that, you will see an extremely verbose listing of 10 separate lines of status, with the temperature data being displayed as status line “STATUS10…StatusSNS…”. Luckily that line hints at the command we need to use to get just the temperatures and nothing else. The magic incantation is “status 10” and typing that into the console input box will return just that single “StatusSNS” line with our sensor data, including the sensor’s unique serial number and an indication of whether it is reporting in Fahrenheit or Celsius, as well as the temperature value itself. There are a number of “setoption” commands in the TASMOTA toolbox and, for those who might need it, the command “setoption8” will change the temperature display units. That’s it for the console commands for now. Next time we’ll look at doing the same thing again, but utilizing MQTT from a remote machine, instead.